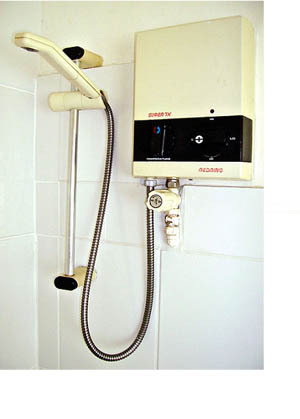 Tankless water heaters, also called instantaneous, continuous flow, inline, flash, on-demand or instant-on water heaters, are also available and gaining in popularity. These water heaters instantly heat water as it flows through the device, and do not retain any water internally except for what is in the heat exchanger coil. Tankless heaters are often installed throughout a household at more than one point-of-use (POU), far from the central water heater, or larger models may still be used to provide all the hot water requirements for an entire house. The main advantages of tankless water heaters are a continuous flow of hot water and energy savings (as compared to a limited flow of continuously heating hot water from conventional tank water heaters).